Would the possessive of cannabis be cannabis' or cannabis's? In regards to the Dunkin' name change, how would AP handle a possessive? 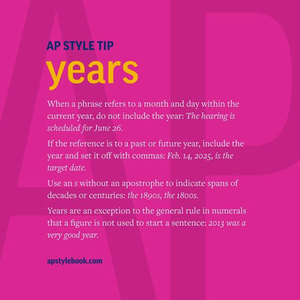 On April 18, you advised hyphenating "year-on-year." On Feb. 28, you said the synonym "year over year" should not be hyphenated. Would appreciate an agreed-upon answer. Thanks. There's not necessarily a 100% right or wrong in these usages. As noted in the hyphen entry, much of hyphen use is a judgment call. I've amended the April 18 answer to conform, deleting the hyphens when not used as a modifier before the noun. For the time period when an article is written, such as with " As of the date this article was written (03/27/19), there are not a lot of positive EvaBot user reviews online", is the day that it was written essential or is the month and year enough? Is there an official style on this, such as with currency exchange articles? Best to be specific and use the day as well as the month and the year. Also, do you mean the day it was written, or the day it was published? Often there's a gap! For primary election results (on air and online), should we use "Democrat" or "Democratic" for the party? We use Republican for the other party. The word is a standalone descriptor below the race name (such as Anderson City Mayor.) I've seen it both ways. For a press release, not a story, are state names spelled out or abbreviated if they stand alone in the body of the release? Is the state name of a government commission / agency like North Carolina Tobacco Commission spelled out or abbreviated? It's typically spelled out as you have it. That's not consistent with the fact that United States is typically abbreviated in such a use: the U.S. Department of Treasury. But that's what usage and our style is for both. Should I capitalize the word Skype in this sentence? The patient skyped with her son daily on her iPad. Hello. I have seen 'too' used with a comma and also without at the end of a sentence. For example, "She will be attending, too." versus "She will be attending too." Which is correct? Either is fine. Depends on what you want with the rhythm of the sentence. Adding the comma puts a bit more emphasis on too. But it's largely a matter of preference and what sounds right to the ear as you read that sentence and the surrounding sentences. For reference to the food processing industry technique of IQF (Individually Quick Frozen), should it be written as "individually quick frozen" or "individually quick-frozen"? The shrimp are individually quick frozen. These are individually quick-frozen shrimp. After the verb, it's not as necessary. But I think adding the hyphen helps with clarity there as well. For my weekly question, are the following very technically correct, as punctuated, under the new hyphen guidance with “to” in a range? Yes or no? The first is fine, if you absolutely must. As for the second (and really, the first as well): I'm going to answer that with the following parts of hyphen guidance, again. That is the answer. We would not sanction writing it the way you have it, regardless of how it's punctuated. If the sheer number of hyphens in a phrase, or confusion about how to use them, can daunt either the writer or the reader, try rephrasing. It’s a guide about how to use hyphens wisely, not it’s a how-to-use-hyphens-wisely guide. Generally, also use a hyphen in modifiers of three or more words: a know-it-all attitude, black-and-white photography, a sink-or-swim moment, a win-at-all-costs approach. Consider carefully, though, before deciding to use more than three modifiers. Does nail biting need a hyphen? Is it one word? Example: Nail biting is a bad habit. The hyphen is optional, but I'd say no. It's clear without a hyphen, right? It's definitely not one word. Would you capitalize "Precinct" when saying Precinct 2030? No, we wouldn't capitalize that. Are the numbers correct in the following sentence? You would not spell out a number when paired with "times of day" correct? If moving calves to the auto feeder before 14 days, feed 2 quarts, three times a day or 3 quarts, two times a day for 7 to 10 days. That's largely correct as of now, but it should be seven to 10 days. And as we discuss our numbers guidelines with an eye to possible revisions: What do you and others think of our guidelines in general, and sentences such as this? If moving calves to the auto feeder before 14 days, feed 2 quarts, three times a day or 3 quarts, two times a day for seven to 10 days. Let's say a hotel is named The Amsterdam Hotel. In running copy, what is the rationale for leaving off "The" in a sentence like this: "Amsterdam Hotel spokesperson John Jones said business is booming." Would you hyphenated multi-trillion in this context? If you shorten the Committee on Special Masters to the Special Masters Committee, would you retain capitalization, or make it the special masters committee? If it's widely known as the Special Masters Committee, we'd likely keep the capitalization. Our existing guidance isn't entirely clear and is under review. We may tweak it next year. There's no entry in the Stylebook for "crown of thorns" in reference to the relic saved from Notre Dame. The dictionary entry refers to the starfish of the same name, not the relic. Some AP stories have it Crown of Thorns, while some have it lowercase. Which should it be? We've discussed and decided to go with Crown of Thorns.